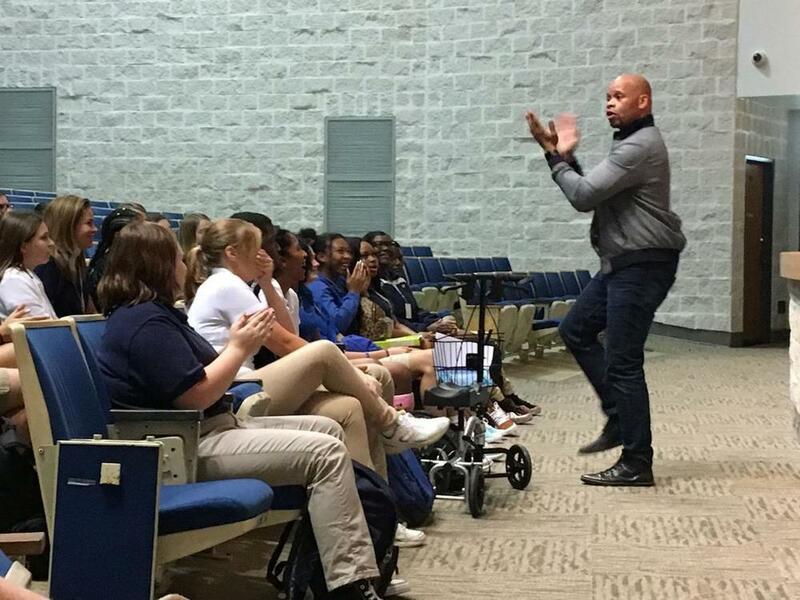 A’ric Jackson spoke at West Feliciana High School on Aug. 13, through a collaborative effort by the West Feliciana Drug and Alcohol Awareness Council, the West Feliciana Education Foundation and the West Feliciana Parish School Board. Jackson’s mission is to “T.I.E.” — teach, inspire and encourage all those who hear him and those who take the challenge of helping others to pursue their goals and dreams. He talked to the 10th, 11th and 12th grade students in the morning and was part of the Freshman Experience on Aug. 13. Jackson shared several points with the students to help them achieve their dreams. He told them it was important to not to get too scared to be themselves or too scared to get mad. Once people get very mad, they can make things happen by destroying their box, which can include feeling not good enough, their doubts or the limitations they put upon themselves. If a box is ruining your life, then you cannot do everything you want to do, he said. Jackson outlined three steps to destroy your box. First, you must acknowledge that there is a box. Secondly, you need to forgive the person who had you create the box. Lastly, you need to forgive yourself. He also emphasized to not hold a grudge. “If you hold onto a grudge more than five minutes, it is too long," he said. "It is like you drinking poison and expecting the other person to drop dead.